if You Want to Check Windows 10 For 30 Days and after Month you want to back Windows 7 or 8.1 you can easily back to Windows 7 or Windows 8.1. We show how to do that and have a trick you can use to make the downgrade at any time. Windows 10 is now 7 or 8.1 to be found mainly as a free update of Windows. It replaced an update to Windows 10, the previous version. But Microsoft is building a a downgrade option. With a few mouse clicks you can quickly switch back to Windows 7 or Windows 8.1 if not satisfied, depending on what was on the system prior to the update. The problem: After 30 days, the downgrade option from the menu of Windows 10 disappears. 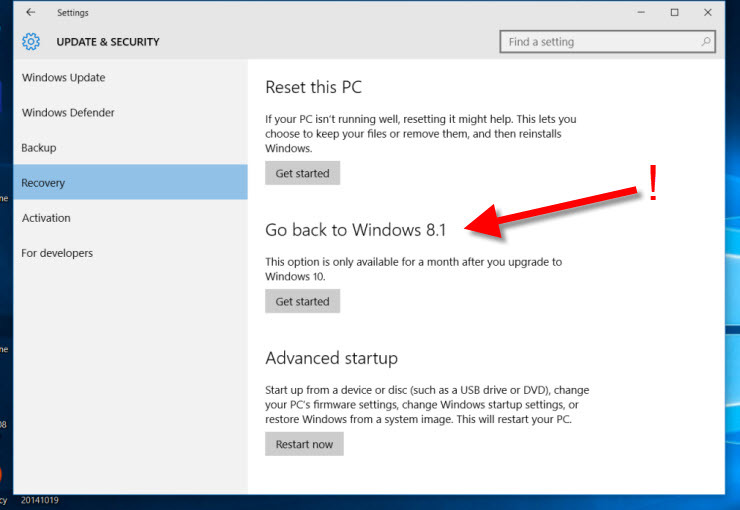 In the “Settings”, refer to the first 30 days after updating to Windows 10 “Update and security” and “Restoration” “Return to Windows 7” menu item or “Return to Windows 8.1”, depending on which both the systems was previously installed. A mouse click on “Go” makes the previous version of Windows from a backup again. Who mitmischt Insider program in Windows, look at this place the menu item “To build earlier return”. As mentioned above, you this way is only available for 30 days after the upgrade to Windows 10 available. The technical update to Windows 10 has well solved Microsoft. In our testing, there were hardly any problems, but with 75 million updates, it is normal that not everything runs smoothly. Anyone who wants to upgrade to Windows 10, should therefore our preparation tips run. Central is there to back up Windows 7 or 8.1. With an imaging software such as Paragon Backup & Recovery or Aomei Backupper you can create a full system backup and play back at any time. This is also the ideal solution when downgrading from Windows 10 to Windows 7 or 8.1, because then you can not only return 30 days but run the downgrade when you want.